For the first time in the history of the current process, MTA will now conduct a study and identify a funding strategy to keep the entire Crenshaw Blvd portion of the Crenshaw-LAX Line in a subway. A full Crenshaw Blvd. subway would allow our children, elderly and the public at-large to walk/drive across the street without having to negotiate with 225-ton trains, preserve over 200 parking spaces crucial to the commerce of local small businesses, provide some basic equity to the system, and reduce the travel time of the train ride by 25% (from Jefferson Park to the future LAX people mover in just 15 minutes – faster than cars!). THANK YOU AND CONGRATULATIONS TO ALL, and to SUPERVISOR MARK RIDLEY-THOMAS! It began as lead member organizations of the Fix Expo Campaign attended MTA Crenshaw Line meetings early in the process (2007) and submitted comments requesting an underground light rail. We diligently followed the process for the next two years, consistently articulating an underground alignment and, procedurally, keeping underground options on the table so that they could be environmentally cleared, a crucial requirement. In October ‘09, when the MTA released the draft study for public comment, over 100 of us attended the hearings in our community at West Angeles and Transfiguration Church, and we flooded the MTA staff with comment forms and emails (not just petitions) with a strategically-focused message requesting a subway in the section that, at the time, had no underground option (48th to 59th Streets). Our numbers were so large and consistent that MTA staff recognized it in their staff report to the board. We spent the month of November pushing the issue on the streets, in the papers and through the airwaves. Our elected officials, many of whom we established relationships with through our Fix Expo advocacy, took note and each of them, from City Hall to Sacramento to Washington D.C. similarly requested that the entirety of the line on Crenshaw Blvd be built in a subway, citing community requests. The political champion along the way was County Supervisor Mark Ridley-Thomas, who as an MTA Board Member kept the project on the drawing board, strategically positioned it to be eligible for hundreds of millions in federal funding, and brought the community, business, labor, faith-based and political groups together, as only he can. Ridley-Thomas welcomed the opportunity to use his board seat to represent our community for safety, equity and jobs and offered the Crenshaw subway motion. In the lead up to yesterday’s MTA Board meeting, we flooded the board secretary’s email box. Then when the meeting was called to order, with the senior staff of our elected officials by our side, we – the community – articulated a message in unison and so impassioned that even westside Supervisor Zev Yaroslavsky, an opponent of subways anywhere except around his Fairfax District home, had to vote for it. At each stage, everyone of you, through your conversations, phone calls, emails and presence played a critical role in our victory yesterday. It would not have been possible without your diligent attention and actions. Within 6-months, MTA staff will present a report on building a subway in the segment between 48th and 59th Streets to the MTA board. We will likely need to be at that meeting as well. MTA staff will also be conducting community meetings about things such as station area planning, likely in the late winter/early spring. And on the contract (jobs) front, the primary contractor for the $10 million study, Hatch Mott McDonald, has been directed to diversify the make-up of their primarily Orange County-based team. We will continue to monitor this process closely, and remain prepared to protest if the changes are not sufficient at this stage in the process. On the Expo Line front, another CPUC Public Hearing, similar to the one held two-years ago (YouTube video), will be conducted to receive community input on the Farmdale crossing at Dorsey H.S. As reported in this week’s L.A. Times article, that decision is still being made, and we’re still fighting the Expo Authority in the courts. The Fix Expo position is that additional cost and delay to the project are acceptable ONLY for safety improvements in South L.A., something the MTA has long known are necessary. All other cost overruns are unacceptable and a product of waste, fraud, abuse and incompetence. 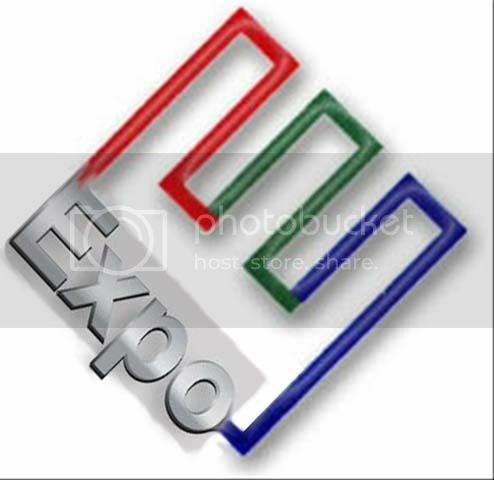 It is why, among other reasons, we’ve requested that Expo C.E.O. Rick Thorpe be fired. We all must continue informing our fellow citizens about these two major projects in our community. The following is the Fix Expo press release requesting Congressional investigation and hearings of MTA, the nation’s deadliest light rail system. Los Angeles, CA – Following two separate Blue Line train accidents yesterday, which left a 45-year old male pedestrian dead in South LA and a 49-year old woman in critical condition in Downtown LA, rail safety advocates are requesting Congressional investigation and hearings into MTA’s rail safety and planning. 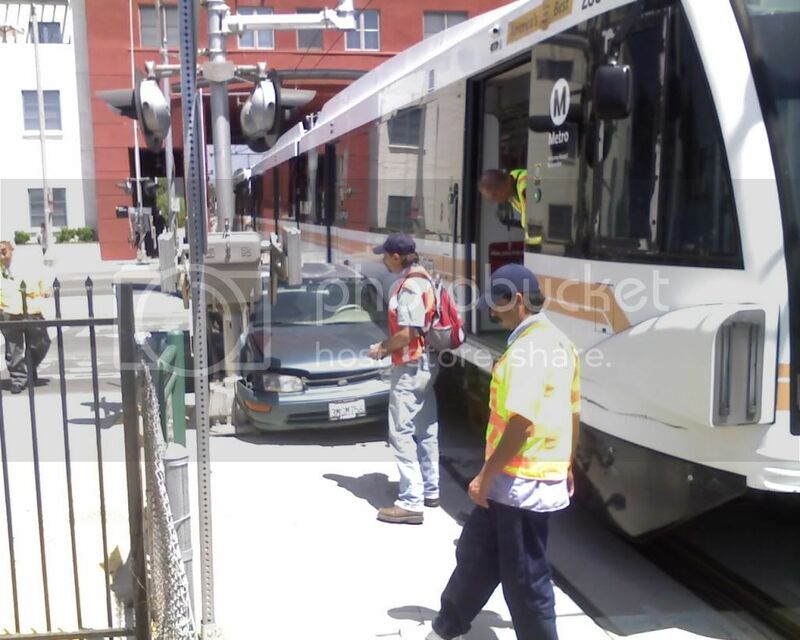 They say the failure of MTA to address safety deficiencies on the light rail after 18 years of operation, along with the expansion of the proven defective design in more complex urban environments in South LA and East LA are the product of a failed rail safety culture that is leading to preventable deaths on Los Angeles’ streets. The two accidents on the Blue Line, which travels at street-level between 35-55 mph in dense urban areas from Downtown LA through South LA, Watts, Willowbrook, and Compton en route to Long Beach, bring the train’s death count up to 93 from over 826 accidents. 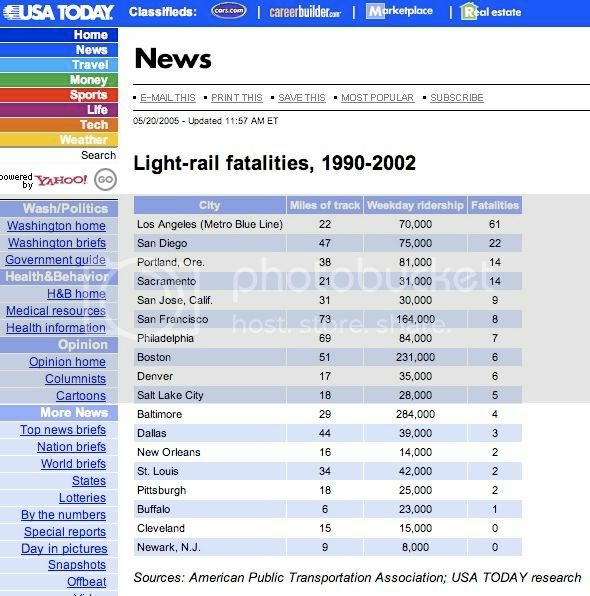 It is the deadliest light rail train in the nation. But rail safety advocates and experts say significant blame also falls on the California Public Utilities Commission and Federal Transit Administration, the state’s railroad regulatory agency and federal transit appropriation agency, respectively. 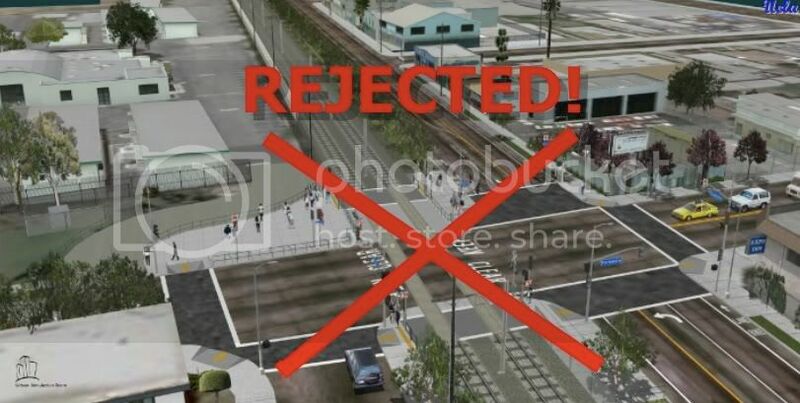 “In addition to allowing the unsafe conditions on the Blue Line to go unaddressed for nearly two decades, the CPUC has granted approval and the FTA has provided funding for light rail designs that are nearly identical to the Blue Line and run through even more complex urban environments in South LA with the Expo Line, and in East LA with the Eastside Light Rail Extension,” said Goodmon. On Friday, the California Public Utilities Commission REJECTED MTA’s proposal to build the at-grade holding pen contraption at Farmdale Avenue right next to Dorsey High School. This is the biggest victory yet for the community, school district, parents, teachers and rail safety advocates, in our long fight for more grade separation on the Expo Line Phase 1, and against the unsafe, unequal, primarily street-level rail line in South LA. We came together and fought back the MTA and particular Westside interest groups and politicians, who have treated our community like nothing but a go-between and failed to show any concern for our well-being, not even the safety of our children. The CPUC could only decide whether to approve or deny the street-level crossing, and they shot MTA down. According to the decision, the CPUC must now facilitate MTA’s environmental review process, to see if MTA’s desired alternative, which just so happens to be the cheapest of the three options (closing Farmdale and building a pedestrian bridge) complies with environmental laws. Only after the EIR process is complete can another application be submitted to the CPUC for their approval or denial. So we look forward to participating in that process and we will call on you to participate as well. The initial proposed decision denied MTA’s application at Dorsey and at Foshay, and required MTA to build a pedestrian bridge at Foshay that would have cost $5-8 million to construct. That proposed decision was written by Administrative Law Judge Kenneth Koss and the assigned CPUC Commisioner Timothy Simon, who both have been monitoring this case for the past 2 ½ years. It was they who attended the public hearings at Dorsey in November 2007 and at Foshay in July of 2008. It was they who presided over the week long evidentiary hearing that involved the testimony and cross-examination of over a dozen expert witnesses. Proving once more that there is truly no low that MTA will not go to push their unsafe design, after the Koss/Simon proposed decision was made public, MTA/Expo spent taxpayer dollars hiring a former Enron lobbyist, Sandra McCubbin, to work to overturn it. McCubbin and the Expo’s high-paid attorney initiated nearly two-dozen backroom/off-the-record meetings with the CPUC Commissioners and staff, and convinced Commissioner Rachel Chong, to author an Alternative Decision to Simon’s, that would remove the pedestrian bridge at Foshay that Simon originally found necessary at the end of the trial. Then Westside politician Zev Yaroslavsky, who doesn’t represent any community within miles of Dorsey or Foshay pressured the Commission (pdf) to overturn Simon’s previously required pedestrian bridge at Foshay and adopt the Chong Alternative. Zev Yaroslavsky has advocated for a $5-8 BILLION dollar subway under his community of Miracle Mile, Beverly Hills and Century City, yet he opposes a $5 million bridge at Foshay to protect the South LA students. Unfortunately, the Zev Yaroslavsky/MTA/Enron-lobbyist pressure worked as the Chong Alternative was approved in a 4-1 decision, with Simon, the only African-American on the Commission, and the Commissioner most intimately familiar with the case being the dissenting vote.